Tom and I just wanted to express to you our pleasure with last summer’s remodel and your fine staff who turned our monster kitchen into a dream one. …Not only is she talented, but she’s also a pleasant person with whom to work, plus her follow up is exemplary. It is a rare pleasure to find a company composed of individuals who take pride in their product and workmanship. Our business with McDaniels and Granite was indeed a pleasure, start to finish, and we could not be more pleased with the end result. Just want you to know that we are really enjoying the new kitchen. It has been spectacular. …Steve says the only thing we underestimated was how much time we spend there. We essentially live in that space on week days and the hallway/guest bath layout you helped us with has worked out perfectly. Thank you so much for your help. My daily words to Steve are "I love my new kitchen!" Grabill cabinets are truly outstanding and worth every penny. We got prices for our new kitchen from every place in Lansing. We thought McDaniels would be too expensive. 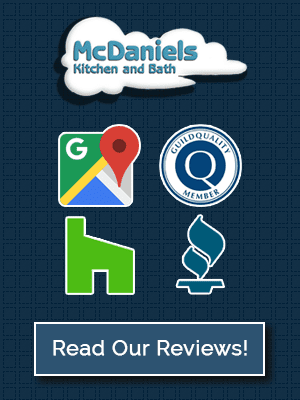 McDaniels turned out to have better prices, and much better knowledge and service. We bought from McDaniels.